Your Top Three Tips For Applying Eyeshadow! Get the answers to the top three questions about applying eyeshadow. How to choose your colors, how to apply them, and how to make them stay once you’ve applied them! How Do You Choose The Best Eye Shadow Color For Your Eyes? And Your Outfit? The starting point for a color search is to take a look at some color schemes that work together for you. A lot of these color combinations are dictated by nature. For example, is it a fluke that so many people with blonde hair have blue eyes? Or that red-heads look so striking with green eyes? 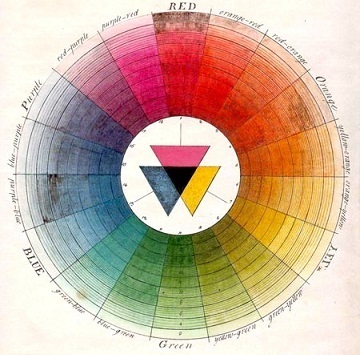 So now let’s introduce the color wheel. This is a representation of colors that’s organized to show you which colors will make sense together. You use it in two ways. The first is to choose colors that have a flowing and blendable effect. 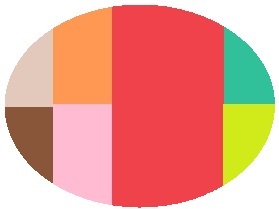 These are called analogous colors, and are next to each other on the color wheel. They flow into each other and create a cohesive look. The second is to choose contrasting colors that are opposite each other on the color wheel. These colors together have a more dramatic effect. They each bring out the brilliance in the other when placed together. Anything else doesn’t quite come together or make sense from a beauty perspective. The colors clash and are just too chaotic for the human brain to contemplate. There’s no balance, and balance whether created by opposing forces or, is the essence of beauty. How Do You Make These Colors Come Together? Look at your face and outfit as a whole. Then choose your colors from the wheel. Let’s go through an example to show you the step by step process that you will use. Say you have brown eyes and you want to wear a red dress. Your starting point will then be the neutral brown, and red. Now you can decide whether you will play up your eyes, lips, or keep the whole look neutral. So in this example, since we’re concentrating on eyeshadow, let’s say you decide to highlight your eyes. So you will then decide on a neutral, light pink or red stain/ lip gloss for your lips. Then pair this with either a pink/orangey eyeshadow palette for a flowing look, or a green eyeshadow palate. Otherwise, you may also choose to combine the pink with green… You take whichever combination you’ve chosen, and apply it using a three or two shadow technique. Preferably, opt for applying eyeshadow according to your eye shape. For a basic look, the lightest color goes all over your lid, and then the second either goes on your crease, or on the outside third of your lid. What Is The Best Method For Applying Eyeshadow? There are three options for applying your eyeshadow. Fingers, the foam applicator that may or may not come with it, or a brush. First get to grips with some eyeshadow basics. The best tool to use is one or two eyeshadow brushes. Why? Fingers are not very precise, they’re better at blending that at applying color exactly where you want it. The foam applicator is just as random. Application is going to include two steps. The first is placing the color where you want it. The second step is the all important blending step. If you can only buy one brush, get a flat eyeshadow brush like this pink one over here. It has a slightly squarish tip and should be nice and firm. Use it to apply the eye shadow. For even easier blending, get a dome shaped eye shadow blending brush like the aqua one. (aren't they so happy looking?). The blending brush has to be all fluffy. Then use this to blend the shadow after applying it. Blending makes the eyeshadow look like it’s coming out of your skin, instead of having being drawn on. Its good to blend everything, including eyeliner! How Do You Stop Eye Shadow From Fading And Going Into Your Crease After Just A Few Hours? When buying eye shadow, make sure it’s highly pigmented. Pressed shadow with a creamy texture works very well. Use some sort of primer on your lids before applying eyeshadow. 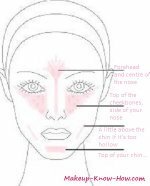 You can use an actual primer, or foundation/ concealer on the lids before applying the eye shadow. When applying the shadow, layer the color. Invest in both a cream and powder shadow of the same color. Then start with the cream color, blend it, then layer the powder shadow over it. Hopefully, these tips for applying eyeshadow help you to sift through many an eye shadow palette…!